White paper on crime 2004 Part2/Chapter4/Section2/2. Fig. 2-4-2-1 shows the trends in the average daily number of inmates of penal institutions since1984.The average daily number of inmates in penal institutions has been on an increasing trend since1993,and it increased by4,535(6.7%)from the previous year to71,889in2003(see Appendix2-5for the number since1950). 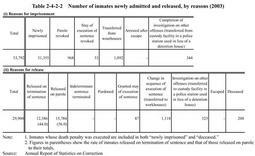 Table 2-4-2-2 shows the number of inmates newly admitted and released in2003,by reasons.